I have been involved in helping families with birth in the Triangle area for over 35 years. I became certified as a childbirth educator with Lamaze International in l979 and am now a program trainer with the Passion for Birth Lamaze Education Program. As a member of the faculty of Passion for Birth Lamaze Education Program, I had the opportunity to go to Beijing, China, in the summer of 2003 and help teach the first group of Lamaze Educators in China. In 2005, I also trained childbirth educators and doulas in Romania. I also have had the opportunity to teach both childbirth educators and birth doulas in Seoul, South Korea three separate times. I have been teaching childbirth education classes since 1979. My classes have a strong focus the Lamaze Philosophy of "Birth Is Safe, Natural, and Healthy" and helping each couple learn about the choices they have and how each family can advocate for themselves. I supported women during labor and birth before the word "doula" was used to refer to a woman experienced in birth who helps other women and families. In 1994 I became the first DONA International certified birth doula in NC, and in l996 I was approved as a DONA International Birth Doula Trainer. Since then I have trained hundreds of doulas in several states and internationally. It is such rewarding work to help these amazingly dedicated women on their journey to learn to care for others during birth. 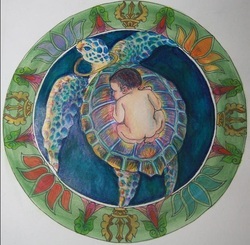 I have helped to mentor new doulas with the WakeMed Volunteer Doula Program. I also regularly presened sessions about Comfort Measures for Labor and Birth to nurses and midwifery students. I present annual programs to the nurse midwifery students at East Carolina University. It is especially rewarding to present at annual conferences. Some of the ones where I have presented are Lamaze International, DONA International, American College of Nurse Midwives, International Childbirth Education Association, and many local seminars and updates. My personal experiences with birth were from the 70s when women had to advocate strongly for themselves. My experiences were positive non-medicated births that were so empowering that they led me into this profession. It has been exciting helping women and families prepare for the birth of their children. And, now I am seeing their children become parents! Over these 35+ years, I have seen attitudes about birth change even though birth and babies have remained the same for centuries. Advances in technology have provided superior help to families experiencing infertility and for babies born early or born with medical problems. My most exciting experiences were to be present at the birth of my grandchildren. I participated in the family-centered cesarean birth of my grandtwins. In 2008, Lamaze International honored me by presenting me with the International Award for my work in China, Romania, and Korea. In 2013 my husband and I moved permanently to Topsail Beach, NC. I love to talk with women about birth. (Just ask my husband and children...my sons now tell me they provide information to pregnant women!) Please call me at anytime at 919-306-1957 or email me at anntumblin@gmail.com to further discuss the role of a doula or a childbirth educator! I work with the sea turtle project in Topsail Beach, NC, and walk the beach looking for turtle tracks.